Le Baou is an elegant, 150 year-old Provençal Country House set in 20 acres of beautiful gardens and grounds. Comprising the Main House with 6 bedrooms and an Annexe with two further bedrooms, Le Baou is surrounded by its own vineyards and the wooded hills of the Massif des Maures and only 14 kms from St Tropez. Featured in The Telegraph’s Ultratravel selection of 12 Luxury Villas and Chateaux in France, June 2013. "Le Baou is simply a paradise: the house has evidently been loved and cosseted over the years, and works very well. The garden has been planted with great skill, and creates a haven of peace and tranquillity seemingly much further from the coast than is actually the case, aided by the fact that all you can see from the pool area is green stretching endlessly down the valley. Three generations of our family had a wonderfully happy week there, children in the pool, shaded meals on the terrace, all the good things in life, and we hope to return." Edward Jones, Hampshire, England. We have just returned from a fabulous week at Le Baou and only wished we could have stayed longer. I have never been anywhere where I felt so at home on holiday. It was perfect in every way.Please pass on our thanks to the owners for sharing their beautiful home. I know it won't be our last visit. 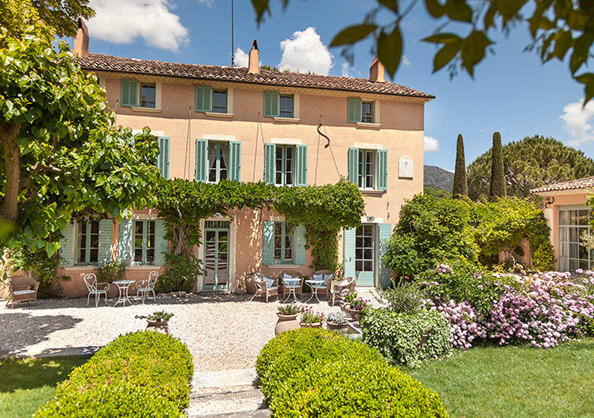 This magnificent ‘bastide’ (country house) was purchased in 1986 by its English owners and has been totally restructured and redecorated inside and out. Le Baou comfortably sleeps up to 15 guests, including children and babies, with 6 bedrooms and 5 bathrooms in the beautiful 3-storey Main House and 2 further bedrooms plus 2 shower rooms in the adjacent Annexe. Hall - south-facing entrance doors open into the terracotta-tiled hall. Sitting room & dining room – spacious and very comfortable living area, with windows and French doors on 3 sides. The dining table seats 14 and the sitting room features a wood-burning fireplace, a large-screen satellite TV, a DVD player, and an iPod dock. Kitchen – large and very well-equipped, including a breakfast table, 4-burner gas hob, two ovens, large hot plate (ideal for 'woks'), fridge, dishwasher, espresso coffee maker etc. Off the kitchen is the larder with a second fridge equipped with a deepfreeze and an ice-maker. Utility Room - with two washing machines, tumble dryer, iron, ironing board and an ice cream-making machine. Bedroom 1 (master bedroom) – with a 5'6" double bed, windows on 2 sides and a separate dressing room. An en-suite (Bathroom 1) features a bath, walk-in shower, W.C. and windows on 2 sides. Bedroom 2 – with a 6'6" bed which can be split into two 3'3"singles and south facing windows. Bedroom 3 – with a 3' single bed and a south facing window. Bathroom 2 – with a bath, bidet, W.C. and windows on two sides. Bedroom 4 – with a 5' double bed, windows on 2 sides and an en-suite (Bathroom 3) with a bath and W.C. Bedroom 5 – with a 6'6" bed which can be split into two 3'3'' singles and windows on 2 sides. An en-suite, (Bathroom 4) has a bath, bidet, W.C. and a north-facing window. Bedroom 6 – with a 5' double bed, windows on 2 sides and an en-suite (Bathroom 5) with a bath, bidet and W.C.
Small room – with a single child’s bed. Bedroom 7 - with a 5' double bed. Shower room 1 - with a shower and W.C. Bedroom 8 - with a 5' double bed and en-suite (Shower room 2) with a shower and W.C. Le Baou is set in 20 acres (9 hectares) of beautifully maintained gardens and grounds, including a large gravelled terrace, walled garden and lawns, swimming pool, sun loungers and sun umbrellas, table tennis and boules. At the front of the House, which is draped in wisteria, a wide, gravelled terrace features a dining table which seats 14, shaded by a lime and a mulberry tree. There are shady seating areas with comfortable wicker chairs, a pretty fountain and a gas-fired barbecue on wheels. Beyond the terrace, an English-style walled garden bursts with colour, whilst behind it a lawn extends to the vineyard, with forested hills in the middle distance. There are many comfortable sun beds, two large sun umbrellas and a ‘boules’ area with ‘boules’ being provided. To the west of the walled garden is the filtered, alarmed swimming pool, measuring 12 x 6 metres, 2 metres at the deep end, and 1.4 metres at its shallow end where there are Roman steps. The pool can be heated at a cost of £120 per week and the pool alarm, which should be switched on when the pool is not in use, is activated by the average weight of a baby (or heavier) entering the water. Le Baou is located in a lovely valley in the Var region of Provence, surrounded by the breathtaking, totally unspoilt, forested hills of the Massif des Maures national park. Vineyard follows vineyard in the valley itself, all suffused with the scents and colours of pine and oak, lavender, jasmine, eucalyptus and oleander. To reach the house, a 250-metre drive leads off the N98 which runs between Bormes-les-Mimosas and Cogolin. It passes through a small wood which separates the road from the property, crosses a ford (dry except in heavy winter rains), and after skirting a 4-hectare vineyard (producing white, rosé and red wines), ascends to the south-facing house. There is plenty of parking to the east of the house, including 4 covered spaces. The village of La Môle is 4 kms away with basic shopping facilities including a bakery, mini supermarket selling same-day English newspapers (which are printed in Marseilles), and 2 or 3 unpretentious restaurants, one of which, the Auberge de la Môle, is widely respected. The sophisticated and enchanting ‘village perché’ (hilltop village) of Bormes-les-Mimosas is 11 kms, whilst the bustling small town of Cogolin is 14 kms, boasting a lively, twice-weekly open-air market and a large, state-of-the-art E.Leclerc supermarket with marvellous fish and cheese counters and an excellent delicatessen selling chilled, ready-to-heat dishes. Le Baou is also only 14 kms from the Mediterranean coast and 20 minutes from St Tropez and Port Grimaud, (journeys at peak hours in the height of summer can take longer!). These are also lots of family-friendly beaches surrounding nearby Le Lavandou. The airport of Hyères (with some international flights) is 30 minutes' drive, and the major international airport of Nice is 90 minutes. There is a private airfield between La Môle and Cogolin. The super-fast train, the TGV, stops at Toulon (50 minutes away). Malika is the cleaner and is employed by the owners, with or without a deputy, for 3 hours per day on Mondays and Thursdays in addition to extra hours when required on Saturdays. Should any additional hours be required, for example for laundry and ironing, tenants should agree this and pay her direct at a rate of €17 per hour. Silvain Allart (Mme Allart's son) is employed by the owners to look after the gardens, grounds and pool as caretaker, gardener, general handyman, and mechanic. Tenants will be met on arrival and will be shown how everything works. As long as sufficient notice is given, a part-time cook and/or a babysitter can probably be arranged. His/her/their/wage/s would be the tenants' responsibility, and, if requested, would be ascertained prior to the commencement of the tenancy. This is an all-year-round House, and is centrally heated throughout. The logs for the fire in the sitting room will be replenished by Sylvain as required. There are fans in all the bedrooms. There are telephones in several rooms. There is Broadband/WiFi internet access. There are 4 cots with mattresses, one of which is a travel cot, and 2 high chairs. There are plenty of English-language books, some board games and playing cards, and a small collection of DVDs. Le Baou has a very useful information folder which contains the telephone numbers of a doctor, a dentist, the emergency services etc. This information folder also contains details of the local markets, local shops selling Provençal specialities, recommended restaurants in various price ranges, and the many cultural and sporting events and activities taking place in the surrounding area. There is also a Tourist Office in the main square in Cogolin. The nearest 18-hole golf course is 20 minutes' drive (Golf de Valcros-Hyères), whilst, among others, there is a 9-hole course near St Tropez, and an 18-hole championship course 45 minutes to the north west (Barbaroux). Full details in the information folder. There are 5 all-weather tennis courts in Bormes-les-Mimosas, plus a number of courts in Cogolin and in Grimaud. Booking is essential in summer. Details in the information folder. The information folder also provides details of lovely woodland walks nearby and horse riding stables, plus bicycles which can be hired in Cogolin. The nearest beach is at Le Rayol/Canadel-sur-Mer. A longer, sandier beach (and preferred by Le Baou's owners) is close to Cavalaire-sur-Mer. Other beaches can be found along the coast on either side of Le Lavandou. St Tropez's most famous beach is Pampelonne (with its 'Club 55'), whilst further south is Gigaro. A visit to St Tropez itself is a 'must', especially on Tuesday and/or Saturday mornings when it holds its outdoor market - one of the best in the region. There is also an outstanding museum (L'Annonciade) in the town's Old Port, featuring paintings by most of the major Impressionists. Guests are advised to avoid the heavy traffic into St Tropez by leaving early in the morning. There are many other highly photogenic villages and small towns in the area. Bormes-les-Mimosas, Gassin, Ramatuelle and Grimaud to name just a few. A visit to elegant, sophisticated Aix-en-Provence (1½ hours' drive) is thoroughly recommended. It's a university city alive with outdoor cafés, restaurants and art galleries, as well as with museums, concert halls and opera houses. The Cistercian Abbaye du Thoronet is well worth a visit, as is the Roman town of Hyères, and the gardens at Rayol Canadel. (There are brochures in the information folder). There are ferry services from Le Lavandou to the Isles d'Hyères (Porquerolles being the largest of these islands). There are masses of excellent local vineyards, many of which encourage tastings and on-the-spot purchases. See the information folder. There's a go-karting circuit between Grimaud and Port Grimaud. There's a gym near Cogolin. A Booking and Security Deposit of £500 will also be payable to Anglo French Properties Ltd on signing this Rental Agreement. This will secure the booking and will cover (a) the cost of international telephone calls made on the landline during the tenancy, (b) the cost of replacing/making good any losses, breakages and/or damages incurred during the rental, (c) pool heating if required (see ‘Gardens and Grounds’ above), and (d) any exceptional cleaning work which may be required at the end of the tenancy. It will be refunded (less any deductions as outlined above) within 4 weeks of the tenancy's conclusion. Unless otherwise agreed, there should not be more than 15 people (including children and babies) staying in the Main House and the Annexe at any one time. Tenants should advise Anglo French Properties Ltd at the end of each rental of any breakages, losses or damages. This is in lieu of an inventory. The house has an alarm system. It can be set should the tenants so request (Mme Allart will show them how to do so).Whether or not the alarm is set, the owners' insurance policy requires that all windows are closed and all outside doors are locked whenever tenants are away from the property. The owner is a professional photographer and the building to the left of the annexe is his private studio.